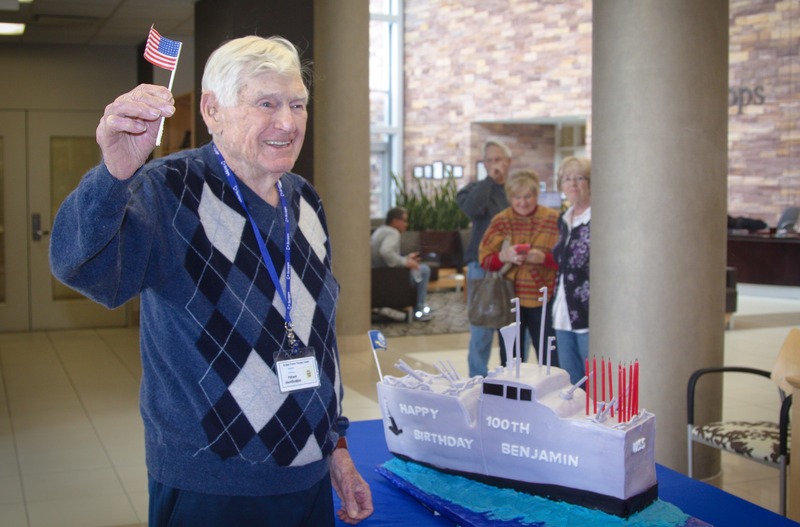 SAN DIEGO, CA--(Marketwired - January 20, 2017) - For Ben Schulman, who turned 100 years old this week, January will be a month packed with celebrations, including a special one held Jan. 18 at the Scripps Proton Therapy Center for completing five weeks of treatment to shrink the tumor in his spine. Minutes after he finished his last treatment, Schulman was joined by friends, family and caregivers for a special bell-ringing ceremony, followed by birthday cake and well wishes. The goal of the therapy was to allow Schulman to maintain his active lifestyle, which includes global travel, business and golf. Schulman, of Carlsbad, plans to immediately begin proving the therapy a success. This weekend, Schulman will be in Nashville, Tenn., where Vanderbilt University has prepared a birthday celebration to honor the 1938 graduate of its school of engineering. Schulman is a Vanderbilt benefactor who spearheaded the development of the university's center of Jewish life that bears his name. Upon his return home, the U.S. Navy veteran and entrepreneur looks forward to once again playing golf and running Schulman Mobile Video, a video production company he owns in Hollywood. Schulman was diagnosed with prostate cancer in 1992 and was treated with conventional X-ray radiation. In 2009, doctors discovered the cancer had spread to his spine and treated it, again with X-ray radiation. After treatment, he resumed international travel a few times a year and golf with his longtime companion, Janet Davis, several times a week. But by 2016, doctors found that a second tumor on his vertebrae was growing, putting him at risk for bone destruction. Schulman was unable to play golf for much of 2016. He did, however, continue to travel, including a trip to Hawaii in December for the 75th anniversary commemoration of the attack on Pearl Harbor. Schulman, a retired lieutenant commander, was aboard the USS Missouri in 1945 when Gen. Douglas MacArthur accepted Japan's surrender to end World War II. Doctors worried that Schulman's metastasis could cause bone weakness. This would increase the likelihood of a debilitating spine fracture, as well as pinched nerves, which would impact Schulman's ability to control his muscles, said Carl J. Rossi, Jr., M.D., medical director of the Scripps Proton Therapy Center. Doctors agreed proton therapy would enable Schulman to maintain his quality of life and resume his active lifestyle past his 100th birthday. "I'd recommend proton radiation therapy to anyone who is a candidate," said Schulman, a father of five, grandfather and great-grandfather. "I feel great and there's no side effects. I'm looking forward to going back to playing golf at least two times a week and just living the good ol' life," he said. "That was one of the reasons his medical oncologist recommended proton therapy instead of X-ray therapy -- to minimize side effects of treatment," said Dr. Rossi. A non-invasive treatment, proton therapy has been shown to be highly effective for adults and children who have solid, deep-seated tumors that have not spread to distant parts of the body. Proton therapy has been used in the United States since the 1950s but is only recently becoming more available. Scripps Proton Therapy Center opened in 2014 for adult and pediatric patient care. It is one of 25 proton centers currently operating in the United States. "The nice thing about treating him here at the Scripps Proton Therapy Center is that we were able to treat him effectively, with minimal impact on his quality of life," Dr. Rossi said. Founded in 1924 by philanthropist Ellen Browning Scripps, Scripps Health is a nonprofit integrated health care delivery system based in San Diego, Calif. Scripps treats more than 700,000 patients annually through the dedication of 3,000 affiliated physicians and more than 15,000 employees among its five acute-care hospital campuses, hospice and home health care services, 27 outpatient centers and clinics, and hundreds of affiliated physician offices throughout the region. Recognized as a leader in disease and injury prevention, diagnosis and treatment, Scripps is also at the forefront of clinical research, genomic medicine and wireless health care. With three highly respected graduate medical education programs, Scripps is a longstanding member of the Association of American Medical Colleges. Scripps has been ranked four times as one of the nation's best health care systems by Truven Health Analytics. Its hospitals are consistently ranked by U.S. News & World Report among the nation's best and Scripps is regularly recognized by Fortune, Working Mother magazine and AARP as one of the best places in the nation to work. More information can be found at www.scripps.org. Ben Schulman celebrates his 100th birthday after finishing his final cancer treatment at Scripps Proton Therapy Center.